Sometimes when you desire to take your relationship to the next level, some random thought pops up in your mind and then you decide to test your partner’s loyalty. It actually becomes imperative for you to know about your boyfriend before you plan to get down on one knee. When you love your partner, you want them to be completely yours. 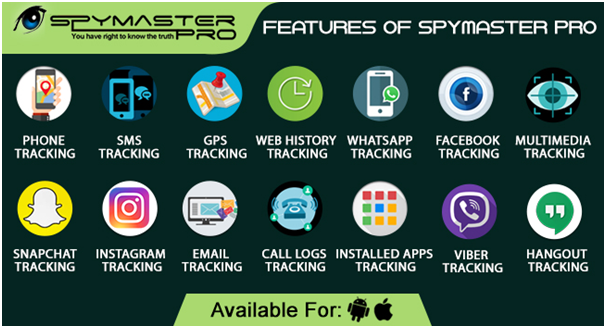 If you have a question of how to spy on my boyfriend’s phone without him knowing then you can easily do so with the help of Spymaster Pro. It can help you to hack his messages and other information. Are you too susceptible to your boyfriend’s behaviour? Want to make sure if your boyfriend’s love is loyal or not? Well, if yes, then the only option this time can be phone monitoring software. No need to make conjectures about your partner, as this won’t prove you right till the time you act on it. So, learn what resides in your partner’s phone and get rid of your harsh thinking. Use the modern Spy program to track your boyfriend. Spymaster Pro is one such eminent spy application which provide you with the precise information. You can watch your boyfriend’s activities easily and supervise his activities. After you download this application on your boyfriend’s phone. How to Catch your Boyfriend Red-Handed Using Cell Phone Software? Well, the safest way possible is to install a cell phone monitoring software on the target mobile. Cell phone monitoring is used by people all across the globe. It can help you to track his cell phone by sitting at your comfort place. You can Track your boyfriend and know his whereabouts. Once you have installed this software in his cell phone, spy software will record all his details. All call logs, emails, Images stored in the mobile, social media chats like Facebook, Whatsapp, Instagram, Snapchat, Viber and many more. Everything will be assessable from anywhere easily and the best thing is that he won’t get any clue that you are having a secret watch 9on him. All the information will be updated to the online account which will be provided to you by your spy software provider. Cell Phone Tracking Software- Easy and Simple to Use! When you have installed the Cell Phone Tracking Software in your boyfriend’s phone then you can check his all text messages and other cell phone information. This tracking software is a powerful tool for all the girls who feel that their boyfriend is dishonest. The cell phone tracking software works in a secretive mode which means they can never be shown in the target cell phone. So your boyfriend will never get to know that you are spying him. It is the easiest way to know if you are being cheated by your boyfriend. Why Cloud Software is the Future for Field Service Management?